Please fill out this form to submit your payment. Form may be used to submit all payments with the exception of Canadian policies. No Annuity/IRA deposits can be accepted. US Policies ONLY – Canadian Policies cannot be accepted by online payment at this time. 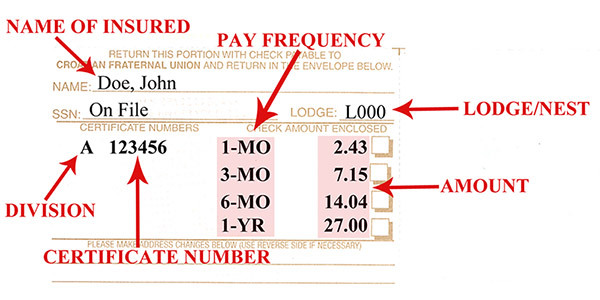 Payment Frequency* How many months are you paying for? Payment Amount ($ USD) for this Certificate* Please enter in USD format (00.00). Please enter numbers and decimal only!! If completing the Juvenile Term Upgrade please apply full $27 amount in Miscellaneous Funds field. Comments Please specify where the Miscellaneous Funds are to be applied.